Pizza, Calzones, Strombolis, & Tuscalinis is where it all begins. Fresh dough. Homemade sauce. Best cheese money can buy. Hand tossed. Each is made to your specifications. If I wouldn’t eat it, you won’t! Soups all homemade. Warm up with my favorite, cream of mushroom. Oh my! Wings. Traditional. Jumbo. Meaty. Made fresh here. Seasoned, sauced, and cooked in our kitchen. I like ‘em cooked well done. Egg rolls, hand rolled and mind blowing - beef cheese steak or buffalo chicken cheese steak. Philly steak sandwiches - chicken or beef, Ours are made in real time, The meat NEVER sits on the grill. So many types including the best buffalo chicken cheese steak on the planet. Hoagies, Sandwiches & Wraps. We roast the beef, turkey, and chicken HERE. The finest Italian meats. If you want delicious and highest quality come to Tommy’s. CHILI CHILI! Yes homemade! Bowl of Chili.Chili cheeseburgers and chili cheese fries! TOMMY'S TOASTIES - Toasted Sandwiches our way! SEE MENU HERE! Grandma Rose is our inspiration. At Sunday family dinners her house was filled with love and the intoxicating smell of sauce cooking on her stove. Walk into to Tommy’s and the smell of fresh cooked food is in the air. At Tommy’s it all starts with Pizza. Our recipe is simple, house made dough and sauce; hand tossed, and finished off with the best cheeses, and freshest toppings. Our menu has grown and we make everything from scratch. Try our Soups, Wings, Stromboli’s, Calzones, Tuscalinis, Philly Steaks, Pasta, Sauces, Hot and Cold Hoagies, Chili, Toasties, Steak Egg Rolls, and Hamburgers. Grandma Rose always said do it right or don’t do it at all. Our promise is to be the best. We are sad to admit we do mess up at times, no excuses here. All we ask is that you let us know, we do care, and please give us the chance to make it right. Call us now at 610-719-9900. Dine-in today for our premium pasta specials, starting at $7.99 and $9.99! Best price in town. Homemade chili on top of our fresh burgers and fries! See below how we make it! All wings are medium. Want 'em HOT? Want 'em BBQ? Just say so! French fries topped with homemade chili, cheddar and more chili! 3 scoops of our homemade chicken or tuna salad on top of a bed of lettuce with tomato, onion, olives, cucumber and carrots. 5oz beef or turkey burger. Comes with a side of chips. Toppings: fried or raw onions, relish, ketchup, mustard, mayo, pickle, sweet or hot peppers, jalapeños. 5oz patty topped with homemade chili, cheddar cheese, and more chili! Genoa salami, peppered ham, extra sharp provolone, hot capicola and more capicola! Sm 8", Lg 12". Choose from grilled or raw onions, sweet or hot peppers, or jalapeños. Extras: mushrooms, pepperoni or broccoli +.65. Add a bit more chicken or beef for 1.99. Chicken, meatball, sausage or eggplant. Sm 8", Lg 12"
Homemade roast beef, horseradish, cheddar cheese. Hand-made crust and sauce. Personal 8", Medium 12", XL 16"
Old fashioned Sicilian pizza, plum tomatoes, onions, basil & romano cheese. Avail. in 8"x8" and 16"x16"
$.99 8" / $1.99 12" / $2.99 16"
Personal 8" $9.29, Medium 12" $15.79, XL 16" $18.79. Your choice of red or white. Includes side salad or soup & bread. Sauce choices: homemade marinara, garlic & oil, alfredo. Add $3 for bolognese. Pasta choices: spaghetti, ravioli, fettucini, angel hair, penne, gluten free penne. Ordering online is easy! Just visit TommysOriginalToGo.com and enter promo code LOVE at check out to get 10%* off your order! When you sign in with your Facebook or Google+ account (or create an account using your email address) Tommy's will keep track of your orders. Place 10* orders online and receive the 11th one on us! Click here to watch a tutorial for online ordering! It's easy! 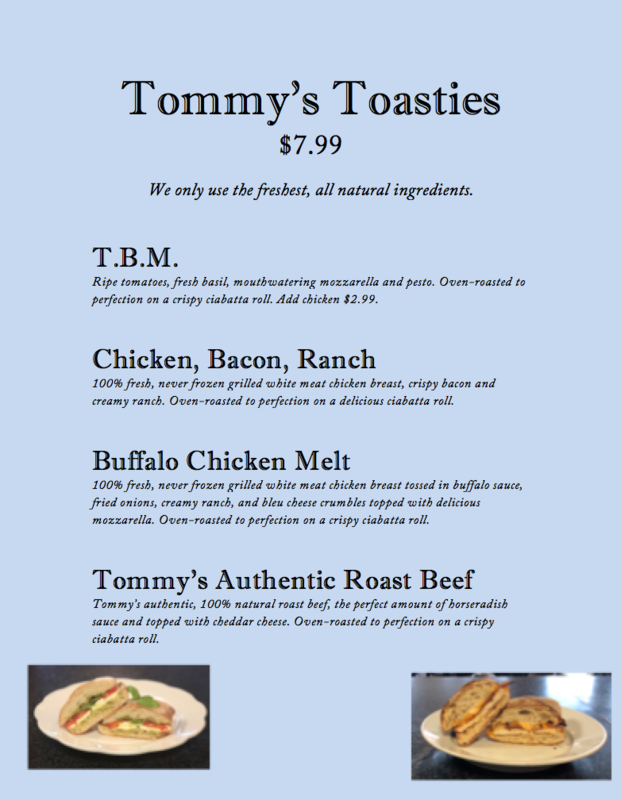 When your organization is looking for delicious ways to raise money, come to Tommy's! Fundraising made easy. Earn while your friends eat. We will give you 20% of the dine-in or 10% of the take-out purchase amount Monday-Wednesday. If you are hosting a big event for a team, tournament or large gathering and need 10 or more pizzas, a discount is available. None of the above can be combined with other offers.